The start of the 2014-2015 school year ushered in huge changes for the Coronado Unified School District. 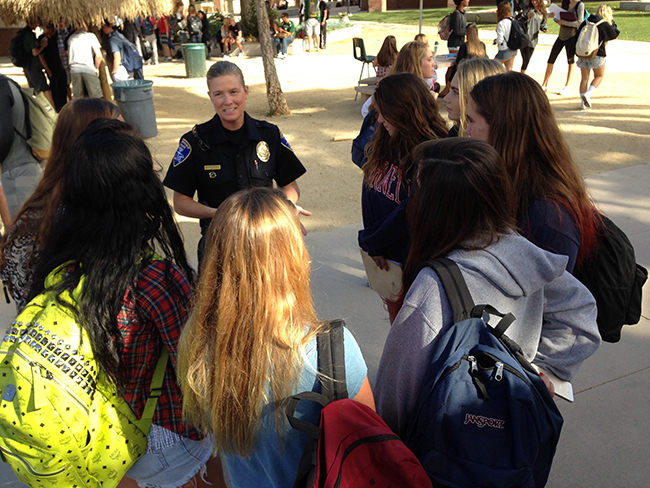 Though budget cuts abound — CUSD has a projected deficit of nearly $3 million this year — Coronado Middle School (CMS) and Coronado High School (CHS) have gained a resource: a school police officer. Mayor Casey Tanaka explained that in the past year, Coronado’s new police chief, Jon Froomin, examined the budget and was able to move one of his officers out of a regional task force to create an assignment for a school resource officer. “The new assignment doesn’t cost the city extra money because the reorganization was done within our existing staffing at the Coronado Police Department (CPD),” he said. After an extensive interview process, Officer Sherri Mannello was selected for the job. Mannello, who has a bachelor’s degree in political science and master’s degree in conflict resolution and mediation, spent 12 years as a deputy sheriff in Orange County before relocating to Coronado in 2010. Mannello and her husband, who’s in the Navy, have a 2-year-old son. After the morning rush, Mannello heads over to CMS to teach the GREAT (Gang Resistance Education and Training) program to sixth grade students. Since the GREAT program’s inception across the United States and South America in 1991, gang membership has seen a 33 percent drop in communities that teach the curriculum. “This program works, and I believe in it,” said Mannello. Mannello also aids administrators at the high school. “When we’re faced with a matter that may need police involvement, we have the advantage of using a police officer who has a student’s best interest in mind versus calling a police officer who doesn’t have as much experience with youth, or doesn’t know our students or our staff,” CHS Principal Jenny Moore said. She has found Mannello to be “terrific” when it comes to dealing with cyberbullying issues, in particular. “It’s nice to have someone that we trust and who also works so well with students,” Moore said. Officer Sherri Mannello offers advice to students on the Coronado High School campus.